Built on solid business practices, Z Line Kitchen is a family owned appliances company. Their products guarantee durability and last for ages. Their line of range hoods solves the problem of effective ventilation with ease. To support their claims of durability, they provide extensive manufacturer’s warranty with each product. As they say themselves, their main goal is total customer satisfaction. If you read on through this Z Line range hood review, you are about to find out if their products back up their claims. To begin with, the review will focus on a product that is fairly specific for several uses. 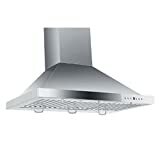 Specifically, the Z Line 36 inch outdoor wall mounted range hood. You can also get it in other sizes, if 36 inches aren’t enough, or are a lot for your needs. The material of choice? Brushed steel. This makes it excellent for any outdoor chef, as well as some commercial cooking environments. Seeing as it is an outdoor appliance, it requires a bit more power. And, the high-performance delivers. Mounted to the wall, you will get a choice of four different speeds. The fan is adjustable to 280, 460, 670, or even 1,200 cubic feet per minute. This should satisfy every need, from basic to high demanding ventilation needs. Both indoor cooks and outdoor grillers should be happy. You get dual-directional lights, which accommodate 3W LED bulbs, as well as 20W halogens. There are steel baffle filters, which are dishwasher safe. This means that you can clean them, instead of replacing them completely. You’ll find two 16 inch chimneys in the package as well. If you don’t really need it for outdoor use, you can also use this range hood for a large stove. Six-burner stoves put off a lot of heat, and you will need a high-power range hood. This one does the job with ease. Since the instructions are same for both indoor and outdoor installation, you could run into trouble. The installation is in no way the same. There are some potential issues, so you’d be best off to call someone who knows what he’s doing. To support the claims of durability, there is a three-year limited warranty. Weather resistance is unknown, so you should put it on a partially covered area. This way you’ll be safer as far as durability goes. You need an outdoor range hood, or, you have a very powerful stove. Either way, this Z Line range hood is great for you since it has a very powerful motor, beautiful design, and guaranteed durability. What more can you ask for?